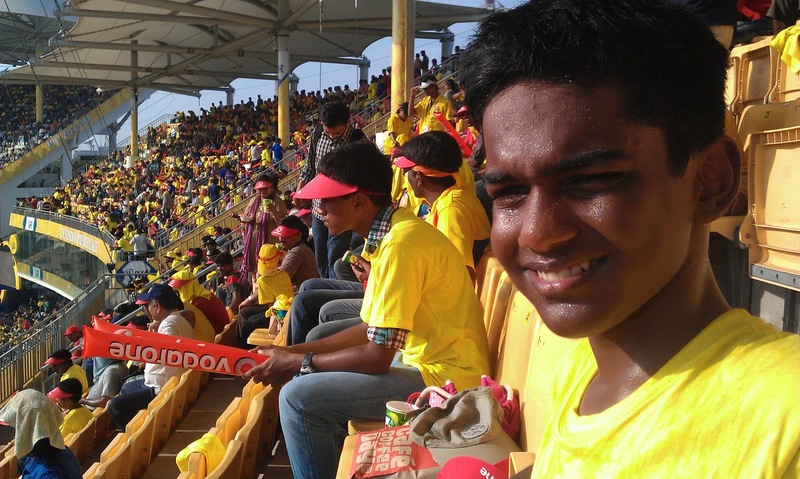 Subash's World: So what is the IPL all about? So what is the IPL all about? Again another post long overdue (actually one year) but better late than never. I had planned to write this last year while I watched the IPL match between Chennai Super Kings and Rajasthan Royals at the Chepauk stadium and was reminded of the same when a similar match took place this year just a few weeks ago. 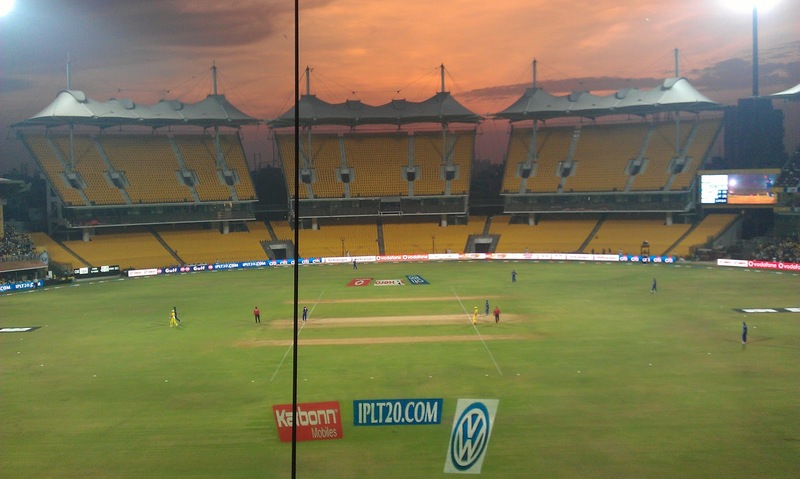 First of all, do any of you Chennaites, regret you didn't watch an IPL match at Chepauk this season? 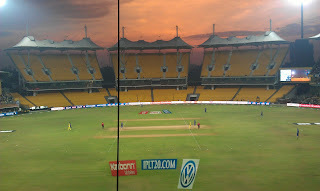 If you are planning to go to a match at Chepauk (well this year all matches here are done), it is my humble request that you don't because it can turn out to be one of most horrible experiences of your life, particularly if it is a day and night match. I am sure this is the case with the other stadiums too where the sun is shining hot and there is little cover from the light and heat. Here is my personal experience. In the blistering heat of the afternoon sun, shooting those hot bright rays straight at me in my seats I almost thought I would faint of a heat stroke. Nothing can be more punishing and miserable than this. Till the match began I kept running out of the nearest exit to take shelter under any little shade that was available. God only knows how many times I did that. So what do you do in the heat? Drink as much water as possible. The stands that supply drinks and eatables are priced exorbitantly. All that pales to the dehydration you suffer. You keep drinking and there will literally be no end to it. The stalls that sell drinks, water and snacks are crowded and they make a killing because everyone is running for water. I must have gulped litres of water and soft drinks that day. Honestly, nothing beats the comfort of your sofa or your cool home for watching the IPL matches on your T.V. 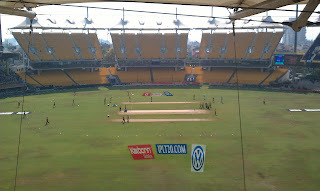 I had been there for my son who wanted to watch Dhoni and Dravid up close. Other than the fact that you are close to them physically it is really difficult to tell if you were really watching Dhoni or Dravid because they are so far away. Many a time you end up looking at the giant screens there to get a better look at things happening on the ground. Compared to that your T.V now captures each and every moment of the game in HD clarity and with enough replays you get to see a match much closer than any spectator in the stadium, though you have to put up with the stale advertising on T.V. You don't have to get dressed for the occasion (for ladies it is worse) as you do in the stadium. Dress or undress, you will be left soaking in your sweat. 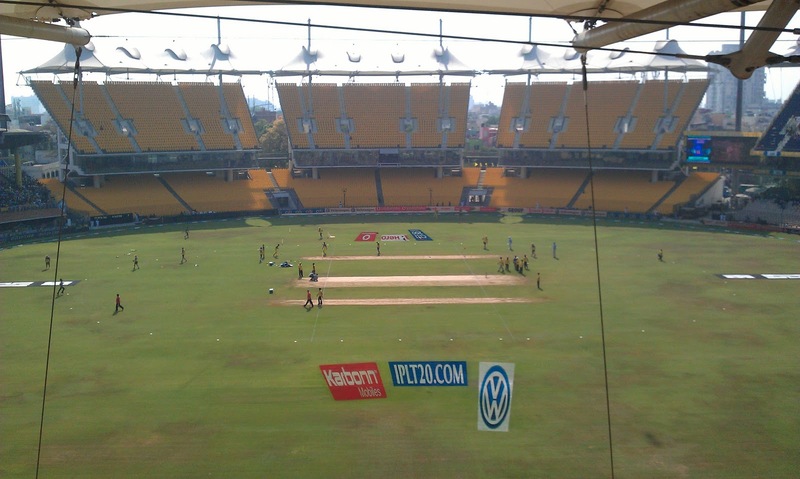 In Chepauk, it is a pity that the very seats and stands that hide the afternoon and evening sun remain vacant even for this year due to legal procedures and processes. What a miserable shame! Here are some pics from last year's match I went to. Chaithu, hot and sweating in the seats. The disputed seats offering shade. That's where one needs to be. The seats at dusk. Thank God the sun is down. So what's the IPL all about? If you ask me, it is nothing but a commercially successful sports-business model, imported, obviously from successful sports-models of the west. I am not ruling out that there is absolutely no talent but for those who admired the beauty of stroke play in Tests, the bashing and hitting T20 format offers hardly anything similar. In 1998, while in the U.S. I went for my first and only ice-hockey game at The Mark, Davenport, Iowa. My boss was a ice-hockey player himself and he asked me to join him and his wife that evening. The local team, The Quad City Mallards were playing a rival team. For me, one thing, clearly, stood-out that evening, it was the voice of the two men behind the microphones who were cheering their team, making comments, announcements etc., Loud, clear and highly motivational these guys made the home-team feel really at home. You can hear this when you watch NBA matches too. The auditorium or stadium resonates with their sonorous voices and the way they pronounce certain words for dramatic effect. For instance while introducting the team they would say something like, "Ladies and Gentlemen, please welcoooome, the Quad City Mallaaaaaaaaards". In the IPL they have a similar person doing this kind of thing though not so dramatically as the guys I head during the ice hockey match. But the "dramatically" part is soon to follow as our folks are only adept at only one thing, "copying" and particularly things from the west. During the break between the first and second halves of the game there were other things going on like someone with a bazooka like gun shooting t-shirt balls into the audience. Then a game with small kids on skates also took place before they got the ice cleaned up for the second half. These kind of dramatic events will soon be incorporated into IPL too. Slogan singing and shouting and booing which are perfected abroad are soon going to be copied too. Honestly Freddie Mercury and Queen's "We will, We will Rock you" makes me cringe every time they play it for the Chennai Super Kings. At IPL, DJ's play loud music through out the match. Whenever something favourable happens to a team, that team's signature tune or music is played and cheerleaders are up and dancing. Rajasthan Royals certainly had a better tune. So is there anything good at the IPL? Yes, here they are, 1. If something happens close to where you are seated, it's real fun. One catch, I recall in particular was splendid but for the spectators located far away they are better off looking at the giant screen. 2. The amazing Spider Cam. I reallly loved this contraption and the way it moved all over the place. Note that whenever the spider cam moves closer to the seating area that portion of the crowd is up and cheering. This when cleverly inserted on T.V gives a false impression that the entire crowd at the stadium is up and cheering. 3. Sivamani - At Chepauk it looks like Sivamani the percussionist has an agenda of his own. His meagre drum set is moved by assistants all over the circumference of the ground and sometimes even in the midst of the dancing cheerleaders. He is in a very jolly mood, drumming, signing autographs and waving to the crowds as though they had all come only to watch him. 4. Finally, the cheerleaders. There were 6 of them for each team and in batches of three per dancing deck and therefore 12 in all. Honestly I was not prepared for what I was about to witness. The girls rock. I have to mention the girls of the CSK team. Skimpily attired they just made the place even hotter. One team, though not visible from my seats was located near and below where we were sitting. The other team was much farther away. One girl in that team was gyrating in such a fashion, I thought, only the pole was missing. The crowd located near that dancing three were definitely getting more than their money's worth. Honestly for the torture that you endure in the heat, they offer some respite. Actually I even felt sorry for them. With all this activity going on the cosmopolitan crowd is euphoric. I was under the impression that for most of the spectators at the stadium there was nothing but a wild sense of Deja Vu. With spot-fixing and with the current arrest of CSK's owner one wonders if entering the final for a 5'th time was also manipulated. My advice - go to the venue and sell your tickets. You'll find takers, a dime a dozen. And watch IPL on your television set in the comfort of your home. So where is cricket headed? T20 has converted cricket into a hitting game. Gone are the beautiful strokes of the Test matches but gone are also the innumerable hours that were taken from our exam study days. T20 has made cricket a much smaller game. Is it good for cricket? Cricket is gradually becoming something else. More on that in my next post. Oh! I actually did in an earlier post. You can read it here. A thing of beauty, a joy forever indeed!